Let’s be clear: Israel is NOT an apartheid state. To listen to much of the media, they would have you believe that Israel is an apartheid, racist state. The truth is completely the opposite. Far from being the monster portrayed in most mainstream Arab media and the brutalising occupier of much of Western media, Israel behaves in a civilised, humanitarian manner that many other nations would do well to imitate. 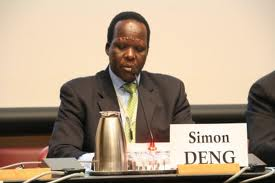 In his testimony to the Durban III Conference held in New York in 2011, Simon Deng, a former Sudanese slave and victim of Arab Islamic racism, strongly refuted the notion that Zionism is racism. He testified how it is Israel that offers a refuge to many who suffer from the racist brutalities of various Islamic dictatorships. He is to be congratulated for taking such a courageous stand on behalf of the truth in a forum where what he had to say was not welcomed. Christians need to beware of being deceived by propanganda disguised as ‘news’. Get the truth and don’t be deceived concerning Israel. God is doing a work there that is unfinished. It’s nothing short of miraculous. Romans 11:26 states ‘all Israel shall be saved’. It is in and through Israel that much of the end-times prophecies will be fulfilled. This is why there is such a spiritual battle going on to alienate the world and much of the church against what God is doing in restoring Israel. “I want to thank the organizers of this conference, The Perils of Global Intolerance. It is a great honor for me and it is a privilege really to be among today’s distinguished speakers. I came here as a friend of the State of Israel and the Jewish people. – I came to protest this Durban conference which is based on a set of lies. It is organized by nations who are themselves guilty of the worst kinds of oppression. It will not help the victims of racism. It will only isolate and target the Jewish state. It is a tool of the enemies of Israel. The UN has itself become a tool against the State of Israel. For over 50 years, 82 percent of the UN General Assembly emergency meetings have been about condemning one state – Israel. Hitler couldn’t have been made happier. The Durban Conference is an outrage. All decent people will know that. But friends, I come here today with a radical idea. I come to tell you that there are people who are suffering from the UN’s anti-Israelism even more than the Israelis. I belong to one of those people. Please hear me out. For over fifty years the indigenous black population of Sudan — Christians and Muslims alike — has been the victim of the brutal, racist Arab Muslim regimes in Khartoum. In South Sudan, my homeland, about 4 million innocent men, women and children were slaughtered from 1955 to 2005. Seven million were ethnically cleansed and they became the largest refugee group since World War II. The UN is concerned about the so-called “Palestinian refugees”. They dedicated a separate agency for them and they are treated with a special privilege. Meanwhile, my people, ethnically cleansed, murdered and enslaved, are relatively ignored. Today, in the Nuba Mountains, genocide is taking place as I speak. The Islamist regime in Khartoum is targeting the black Africans – Muslims and Christians. Nobody at the UN has told the truth about the people in the Nuba Mountains. Do you hear the UN condemn Arab racism against Africa? (hypothetical question) What you find on the pages of the New York Times, or in the record of the UN condemnations is “Israeli racism” or “Israeli crimes” and Palestinian suffering. My people have been driven off the front pages because of the exaggerations about Palestinian suffering. What Israel does is being portrayed as a Western sin. But the truth is that the real sin happens when the West abandons us: we the Africans in Sudan – the victims of Arab/Islamic apartheid. Khartoum declared jihad against my people and this legitimized taking slaves as war booty. Arab militias were sent to destroy Southern Sudanese villages and were encouraged to take African women and children as slaves. We believe that up to 200,000 were kidnapped, brought to the North and sold into slavery. I am a living proof of this crime against humanity. I don’t like talking about my experience as a slave, but I do it because it is important for the world to know that slavery exists today. The United Nations, which I call the United Nothing Nations, knew about the enslavement of South Sudanese by the Arabs. Their own staff reported it. It took UNICEF – under pressure from the Jewish –led American Anti-Slavery Group, and also led by one of my friends sat here today Dr. Charles Jacobs (thank you very much) — sixteen years to acknowledge what was happening. But the Sudanese government and the Arab League pressured UNICEF, and UNICEF backtracked, and started to criticize those who worked to liberate Sudanese slaves. In 1989, Dr. Gaspar Biro, the courageous Hungarian man who worked with UN Special Report on Human Rights in Sudan who reported on slavery, resigned in protest because the UN did nothing about his report. As a former slave and a victim of the worst sort of racism, allow me to explain why I think calling Israel a racist state is absolutely absurd. I have been to Israel five times visiting the Sudanese refugees. Let me tell you how they ended up there. These are Sudanese who fled Arab racism, hoping to find shelter in Egypt. They were wrong. When Egyptian security forces slaughtered twenty six black refugees in Cairo who were protesting Egyptian racism, the Sudanese realized that the Arab racism is the same in Khartoum or Cairo. They needed shelter and they found it in Israel. Dodging the bullets of the Egyptian border patrols and walking for very long distances, the refugees’ only hope was to reach Israel’s side of the fence, where they knew they would be safe, and indeed they were safe. Is Israel racist? To my people, the people who know racism – the answer is absolutely not. Israel is a state where people who are the colors of the rainbow. Jews themselves come in all colors, even black. I met with Ethiopian Jews in Israel. Beautiful black Jews. I came here today to tell you that the people who suffer most from the UN anti-Israel policy are not the Israelis but all those people who the UN ignores in order to tell its big lie against Israel. We, the victims of Arab/Muslim abuse: women, ethnic minorities, religious minorities, homosexuals, in the Arab/Islamic world are the biggest victims of UN Israel hatred because the UN will not tell you when the gays are being stoned to death in Iran, except they will tell you that Israel should not defend themselves when they are being attacked. Look at the situation of the Copts in Egypt, the Christians in Iraq, and Nigeria, and Iran, the Hindus and Bahais who suffer from Islamic oppression. The Sikhs. We – a rainbow coalition of victims are the targets of Jihadis — all suffer. We are ignored, we are abandoned. So that the big lie against the Jews can go forward. On January 9 of 2011 South Sudan became an independent state. For South Sudanese, that means continuation of oppression, brutalization, demonization, Islamization, Arabization and enslavement has to end. In a similar manner, the Arabs continue denying Jews their right for sovereignty in their homeland and the Durban conference continues denying Israel’s legitimacy. As a friend of Israel, I bring you the news that my President, the President of the Republic of South Sudan, Salva Kiir — publicly stated that the South Sudan embassy in Israel will be built— in Jerusalem. Not in Tel Aviv but in Jerusalem, the eternal capital of the Jewish people. I also want to assure you that my own new nation, Southern Sudan, and all of its peoples, will oppose racist forums like the Durban III conference. We will oppose it by simply telling the truth. Our truth. My Jewish friends taught me something I now want to say with you: AM YISROEL CHAI! (the people of Israel lives). Thank you very much.